First let me say that I wholeheartedly agree with you on this issue. You are really one of the only people that I know of that takes such a strong stand against contemporary music of any kind. Having said that, an unfortunate fact of life is that if you believe this way at some point you will have to put up with it in the church that you attend. The most conservative churches that I know of in my area sing the old hymns, but still allow toned-down contemporary songs to be sung for the special music. It seems that there are areas that pastors just aren't interested in going anymore, and to a certain degree I guess I understand. If you preached on social media, dress, the dangers of the internet, and the god of entertainment in most places today you wouldn't have more than a house church. These topics seem to be off limits with anyone under 40. I am not sure what the answer is other than prayer and continuing to stand when your Pastor and church may not agree with you. I don't take a holier than thou approach to these things, but I try not to compromise in my own life and in my home. I support my Pastor, and will not undermine his authority. I do fear as you do that my children and grandchildren will not take the same stand because of the influence that they will find in most churches. Thanks again for the stand that you take, and for your informative newsletters. Thank you for taking the time to write. From my experience, you are absolutely on target. There are extremely few Independent Baptist preachers who truly care about the music issue and are properly educated about it and are effectively educating the people and barring the door against contemporary worship in all its forms. 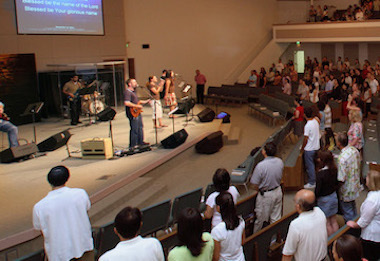 Many are still keeping the focus on hymns in congregational singing, but it seems that this is only because of tradition and an apparent desire to remain somewhat "conservative" and a fear of being "contemporary." But because of their ignorance of what contemporary music is and its real danger even in its more subtle forms, they are unwittingly allowing the camel's nose into the tent, and it is only a matter of time until the tent falls. One of the major reasons why so many Independent Baptist pastors are weak on the music issue is that they aren’t being challenged and led by the influential preachers. In fact, as we have extensively documented, the biggest names in Independent Baptist churches and schools are leading the way in “adapting” and “borrowing from” contemporary worship music. As Dr. Lee Roberson used to say, “Everything rises and falls on leadership,” and the biggest leaders are exceedingly weak and near sighted on this, and they don’t care to listen to warnings. I am confident that the reason for this is the desire to keep the crowds, contemporary-ish music (whether Southern Gospel or the Townend-Getty stuff) being very popular, but the Lord is the only one who knows men’s hearts. Whatever the motive, the result is the same: bridges are being built to the one-world church through music, and the young people are going to cross those bridges. As for only having a house church if you preach the whole counsel of God and apply God’s Word to every part of daily living, that will be the case in some places, but it is certainly not the case everywhere. We had 300 at our annual missions conference this year, and I know many churches of a good size that preach everything I preach. Some run in the many hundreds in every service. As to what can be done, if I were in a place where there was no church that took an educated and Scriptural stand on the music issue, I would ask the Lord to open the door for me to move to a place where there is such a church. I would do this by faith, knowing that God has commanded me to earnestly contend for the faith once delivered to the saints (Jude 3), and it is impossible to do this properly apart from a sound church. The God-designed church is the pillar and ground of the truth (1 Timothy 3:15). Truth, therefore, is a fundamental essence of a sound church, and if a church is not committed to absolute truth in every area, it is not doing its job before the Lord and is on the way to compromise and apostasy. I would make the move for the sake of my own soul and for the sake of my family, both in this generation and the next. I would take a cut in pay and do whatever I had to do to make that happen. A good church is more than worth it. Many parents have testified to me that being in the right church was a major reason why their grown children are serving the Lord today. Last year, I believe it was, I met a grandfather at Fairhaven Baptist Church in Chesterton, Indiana, who told me that his children and now his grandchildren are serving the Lord. He said that he moved to that area many years ago when his children were young and he had bought a house. Afterwards he found Fairhaven and knew this was where the Lord wanted him to raise his family, but it was more than an hour’s drive from his house. He put the house on the market and commuted to church every service. He thought his house would sell quickly, but it took more than two years, if I remember correctly, yet he continued to commute to a good church rather than settle for a mediocre one. The sweet fruit of this wise decision has already continued to the second generation.